All Google Management agencies must charge fees if they make money from your campaign. Some make the bulk of their profit as hidden fees. Discover how fees work and how to avoid hidden fee scams. Management fees are the portion of spend retained by your Google management agency. It is ther cost-of-service for managing, maintaining, and delivering your campaign strategy. All agencies are not equal. Some have higher fees and some claim to deliver a superior results. As the advertiser, it’s your job to get informed. You need to weigh the cost of service versus any potential campaign advantage. This can be difficult. Especially for new advertisers whom are not familiar with Google’s advertising platform. Whatever the fees, the agency need to make up their cost with enhanced performance. They should pay for their service with improved results. Instead of fee transparency, it’s very common that agencies charge hidden fees. Often quoting a low management fee, and then adding the additional fees on top of the cost-per-click. Deceptive pricing: The agency may not use the correct advertising budget as agreed with you. Make sure that you get an official copy of your agreement in writing. I created this short video to explain how to detect and avoid hidden fee scams. Hidden fees can kill your campaign. The problem is, many advertisers think they are paying low fees when the reality is quite different. 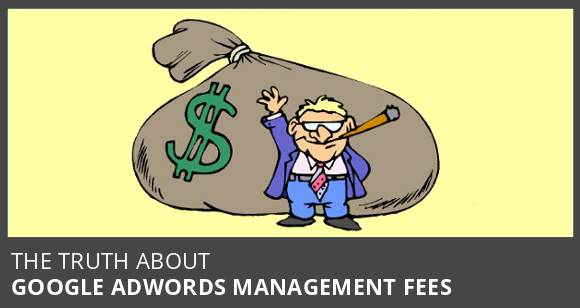 Make sure you get informed about Google management fees. You can follow my guidelines in my Hidden Fee cheatsheet to get full fee disclosure.